Semafone was on the road last week in the USA, attending two major industry events – the CNP Expo in Orlando and Genesys’ CX17 Indy show in Indianapolis. We had a very productive week, meeting prospective customers, reconnecting with existing ones, and catching up on the latest security and compliance developments in the contact center industry. The 2017 installment of this longstanding show brought together vendors, merchants, and industry experts to discuss trends in the Card-Not-Present industry and share current best practices. We were kept busy throughout the conference discussing the latest in payment security, as well as showcasing Cardprotect, Semafone’s patented award winning secure payments solution. Our money booth—where participants had twenty seconds to step in and grab as many mock credit cards as they could, was a real hit on the Semafone stand. Congratulations to everyone stepped inside to catch the colored cards & won an AMEX gift card! Fraud featured heavily on the agenda and one particularly interesting session was an exclusive look at ‘The True Cost of Fraud’ study for 2017 from LexisNexis Risk Solutions. I’m looking forward to reading the full findings when they are released later this month (In the meantime the 2016 report can be found here.) One thought-provoking finding mentioned was that although fraud has increased, most companies are still employing the same old methods to combat fraud. As instances of CNP fraud and costs increase, surely pressure will be placed on merchants to ensure they are using the right methods to mitigate fraud risk. Given this, it will be interesting to see whether the adoption of more complete and robust solutions is reflected in the 2018 report. A key highlight was Semafone’s Pre-Sales Engineer – David Scheidemantel presenting on the demo stage, where he shared his personal call center experience from years in the industry, and offered attendees advice on how to reinforce their call centers, reduce security costs and minimize their PCI DSS scope. About 1000 miles away in Indianapolis, our partner team were excited to take part in Genesys’ annual conference which brought together Genesys customers, partners, and team members from across the US to discuss the latest insights into the agent and customer experience and showcase the newest Genesys product developments, like the new Kate AI engine. Semafone kept busy in the Partner Pavilion, where we were one of more than twenty-five partners meeting with a range of people from many different industries to discuss their current call center security and PCI DSS compliance issues. A topical theme that customers repeatedly wanted to discuss was the inadequacy of solutions like Pause and Resume call recording systems they had already implemented. Most found that after the solution was in place, it had not been working as expected or was still failing a PCI DSS audit. Much to our fortune, in many customers’ eyes, a DTMF solution like Semafone was the natural upgrade to this. One surprising thing we found was after asking about customers’ plans for the implementation around the EU GDPR next year, most American companies had never heard of it, never mind had plans to address it! It’s clear that US companies need to be educated around this major legislation that will affect any company dealing with the information of EU citizens. We’re on the road again next week this time at CX17 Brussels next week and are looking forward to returning to CX18 in Nashville! We were also thrilled to bring home two awards from these shows. 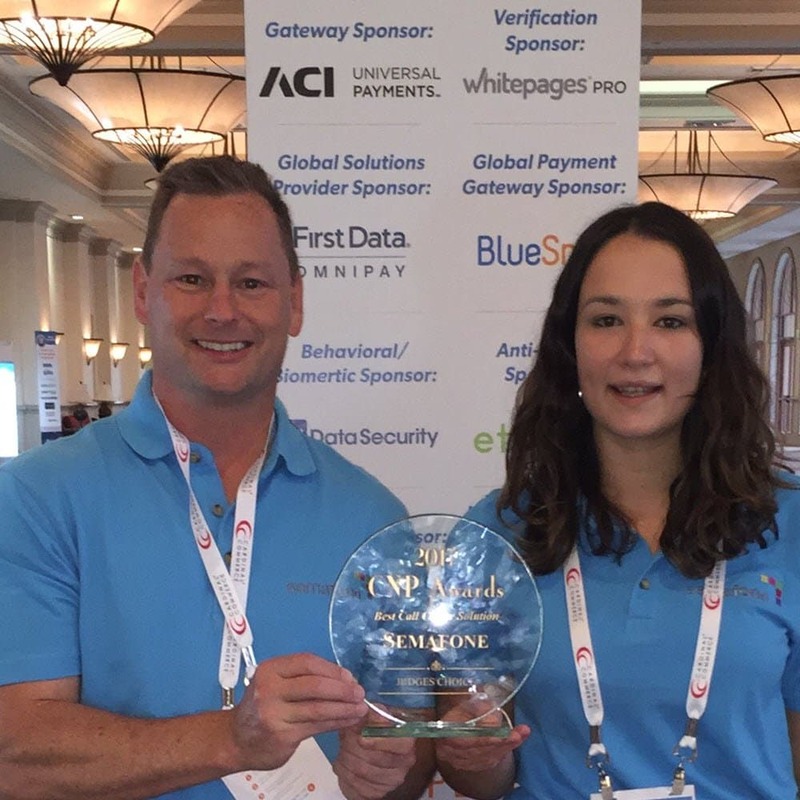 At the CNP Expo, we were delighted to win the Best Call Center Solution – Judges Choice, our third year in a row winning an award at the Expo. At CX17, we took part in the Demo Battle, where we duked it out against other partners’ demos and were pleased to be named among the winners there as well. Now that we’ve returned home from a whirlwind week, we’re feeling energized to continue our mission of securing payments and helping customers achieve PCI DSS compliance. If you were at either of these events, it was great to meet you, and we hope to talk to you again soon!